Eastern Front is a free mod for Company of Heroes. Following the ethos of mimicking a Relic Entertainment expansion pack, Eastern Front has succeeded in adding two full new factions, the Soviet Red Army and the German Ostheer, packed with unique and exciting units to the existing armies - a feat never before achieved in the Company of Heroes world. 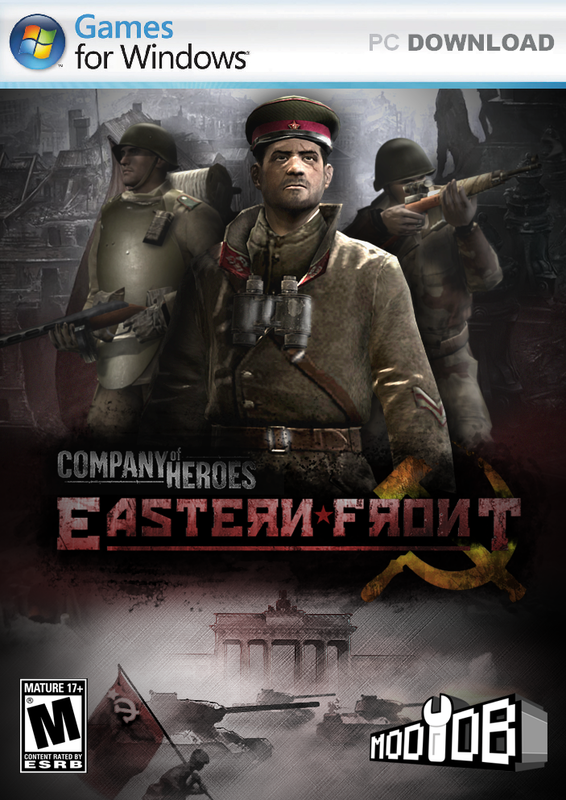 It is January 21st, 15.00 hours GMT, and Company of Heroes: Eastern Front is released. On June 22nd, 1941, five million axis soldiers crossed the borders into the Soviet Union, beginning the largest, most ferocious and bloodiest theatre of war in history. This is the Eastern Front. That has to be a record on Moddb.. This is the best CoH mod ever, thank you for releasing it. Really love your mod! Alesi, hunk, you're both **** with no brain, congrats. Anyway, going to install COH again just to try this, sounds awesome! as i was saying, kill the communists! The communist world fell apart in '89 idiot. The communist countries didn't resort to violence to prevent their collapse so I am not sure what the hell is going inside your head. Remember 45... that was bigger ownage than 89. I think everyone misunderstood violetblood's message. He was just asking what is the difference between the nazi symbol and the communist one at the time being. It's a good question because some answers might be covererd by hypocrisy. History shows clearly that neither nazism or communism are the craddle of humanity. I don't think that Violetblood is a nazi supporter, he is from Romania and like we all know in 1989 there was the Romanian 'revolution' which marked the ending of communism ... even if, 'IT' remained as a mentality for more than 20 years among the population. I hope I cleared some of the confusion. I want to say that I admire the initiative and dedication of the developers to make this mod and I think all COH fans will enjoy playing it. Great work guys, congratulations on the release, COH sorely missed the Reds! you are right . I am from Romania too and while i was born in 1989 , i do know lots of stuff about the revolution . it was quite violent . I read somewhere ( i don't remember where ) that communism is a god ideea , but everytime it is applied in real world it turns out to be bad , it fails . Both communism and nazi are evil things anyway . Really buddy. We don't need to hear your neo nazi ideals here. If you want to talk amongst other neo nazis like yourself, go visit the sewers and I am sure you will be accepted there. you don't think communism spread suffering? hahaha look at history, look at all commie countries and all the suffering and pain, the NKVD would kill you or imprison you for doing anything the state didn't approve of, **** they were even worse then the nazis, the german death camps = bad..
but compared to the russian Gulags.. their kindergarden. besides you don't need to be a nazi to hate commies, america hated commies, they weren't nazis, they were capitalists, democrats and republicans. now that history has been corrected this is one awesome mod, i can't wait to play it with my friends, really looking forward to this, it'll be AWESOME using MG42's to take out my friends annoying infspam.. but this time.. it will be realistic with waves of russians charging my mg positions:D YAY! your god says that homosexuals should be put to death, so i don't think Jehovah hates bigots buddy. Communism calls for the abolishment of the state, no so-called 'communist' country has achieved this, what they have achieved is a form of repressive state capitalism. There has been no such thing as a communist state... it is in fact an oxymoron. Exactly, comrade, communism was misunderstood for a long time and in many different ways. What is the exact problem, Setis? After extracting and installing it, I can't seem to launch eastern fronts. It only brings up coh. Keep in mind that this is the first time I'm installing a mod for coh, so I'm probably doing some noob mistake(s)! Thanks for your help in advance though! Make sure you run through the EF icon on your desktop (that looks like my picture), not the CoH icon. i have the same problem.appear lock. I had the same problem, it worked after patching the game to 2.601. Hmm first bugs from the front. Is any of Soviet infantry squads able to capture unused mortars, hmgs, at guns? I've noticed, that they're able to pick up weapons through. and KV-2, does it have to have so **** armor? I would kiss the EF team if we weren't a ocean apart. What is this? atack of nazis and idiots? Mother Russia is pleased with your endeavors EF Dev Team. Holy **** i can't download it!!!! It starts but 10 min later it stops at about 115 mb!!!! Works with Steam CoH (not OF)?